At the Made In Yorkshire Christmas drinks, there was a section where Lord Whitby spoke about the UK Manufacturing PMI being positive. As he explained what the PMI is, I imagine it went unnoticed the smug look on the faces of the Yorkshire Profiles team. This is because we already monitor the MFG PMI and every month an analysis is posted in the canteen for the employees to read (if they choose to). The divergence of the indicator vs [quarterly turnover vs prior year] is a long-term KPI for the business that I established many years ago. 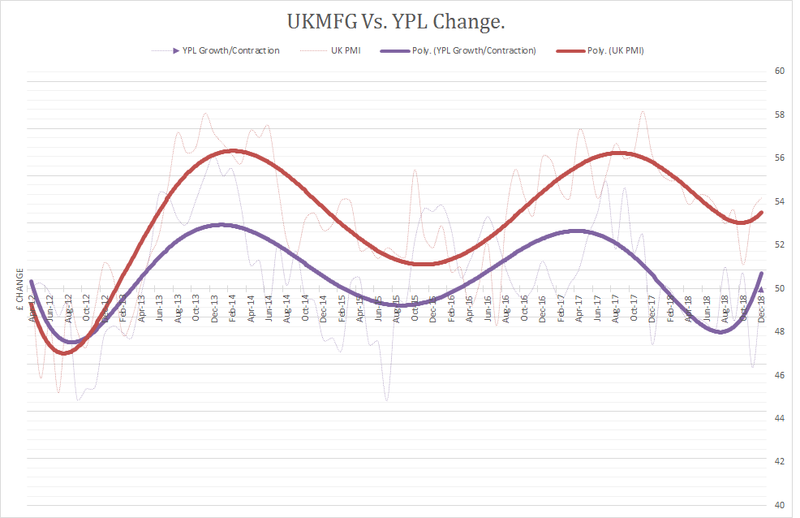 Below is a graph of our growth and contraction periods vs the PMI. Beautiful. You might be wondering why such an obscure stat as [quarterly turnover vs prior year]? It accounts for ‘seasonal adjustments’ without having to measure a full year, just like the PMI does. A key point is that our [quarterly turnover vs prior year] figure changes direction sometimes months before the PMI does. This is critical information to the mid-long term plans of the business. If our QTO changes and PMI does not follow shortly after, we are doing something wrong/right (depending on the direction of divergence). If our QTO changes and PMI follows, then market forces are at play on our company and we need to act accordingly. Take note that this has been the case all 5 times in the last 7 years. So what point am I trying to make by sharing this inside information? Well over the last 12 months I have been planning for two scenarios. Scenario 1: A continual decline in our TO/PMI to where it falls below the critical 50 point. Scenario 2: The upturn we can see at the end of the chart and the start of the next growth cycle. I’d like to focus on scenario 1 which did not play out. It’s important to plan for contraction just as much as it is for expansion. The problem is, there is a lot more enthusiasm from suppliers, providers etc when a company is pushing for growth. When you’re planning for contraction periods, you are given the impression that you are failing. It triggers rumors and suppliers, providers etc drag their feet with the necessary preparations. This is both ironic and unfair because if you don’t plan for and act quickly during the contraction periods. You will fail. From many providers I have been met with “Lets talk about it, if it comes to it”. If that was the same attitude for growth periods, you’d miss out and would expand at the peak of the market cycle. It’s also worth noting that although the PMI remained above 50 during 2018, the effect on company turnover was negative during the slow down. So a positive PMI does not necessary result in growth for a company if the month on month result is falling. I guess I am raising this point publicly as we are seeing a growing number of companies in the laser cutting / fabrication sector closing down. Obviously I do not know the exact individual causes, but I certainly could have predicted it using the graph a year ago. Just as much as new start-ups / investment will occur during the next up-cycle (and more than likely those same closed companies with a ‘new’ name). I wonder if their providers had helped them out a little more to reduce their spend (if they had asked for it) they will still be in business and they would still have a customer, one which would grow on the next upward cycle? Also, a point to our current and potential clients that we do monitor such long term cycles. I’m not interested in demonstrating eternal growth or boasting that every year is better than the year before. Let’s be honest, 2018 was a… ‘poor performing’ year for a lot of companies, but we’re still here and if you’re reading this, hopefully you are too. I’m interested in being your sustainable supplier today, next week, next year and onward. Sometimes this will mean reducing or restricting capacity/services during downturns. Whilst I don’t have to consider ‘downsizing’ in the current market cycle, I definitely have a plan in place if I needed to, and that should be reassuring, not concerning. Remember: The trend is your friend, until the end. It has me thinking, do other companies monitor and act upon such nationwide metrics for growth/contraction planning? And how prepared are you if the economy goes belly up?